Runners are walkers too. I had it in my head that “runners” run. Period. That anybody who could claim the distinguished title of “runner” didn’t waste their time with pedestrian pursuits such as walking. Or chatting. Or full-out stopping. And I was determined to run my first half-marathon. Run The whole thing. Every single inch. Somehow I had convinced myself that only ceaseless, constant, unalterable running would qualify me as a runner. At least, that’s what I thought while I ran alone. Then, I started running with other runners. Runners who stopped to adjust their shoes or braces. Runners who paused to thank the volunteers handing out Powerade. Runners who waved goodbye to their friends as they stopped to visit the porta-potties along the route. Runners who walked. People who I never once doubted were “real” runners. People who were much faster than me. Much more prepared. Wearing much nicer gear than I was. And there they were, not running. 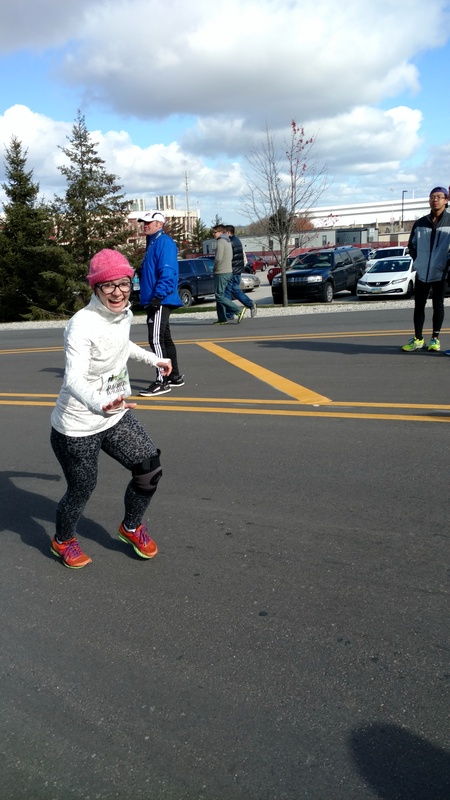 Seeing these runners take their time, recognize when they needed to recover, stop when their bodies were telling them to, it finally lifted the terrifying weight of my own expectations off of my shoulders. At mile 4, I stopped on the side of the road to tighten the straps on my knee brace. At mile 9, I walked up a difficult hill. I walked about half of mile 12, saving my strength for the hard push to the finish line. 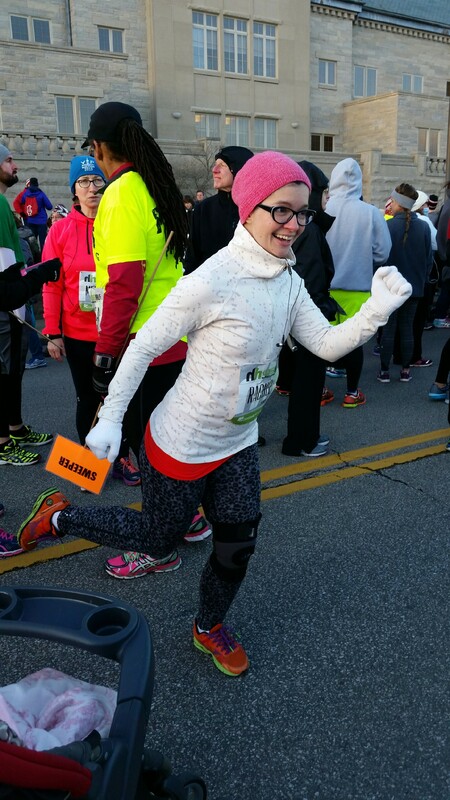 I’m still a little embarrassed to admit all of the times I had to rest—and for my next race, I’m going to try to work on my endurance—but I finally see that I can still think of myself as a runner. Even when I’m walking. If the race officials say the course is “challenging” they mean it! 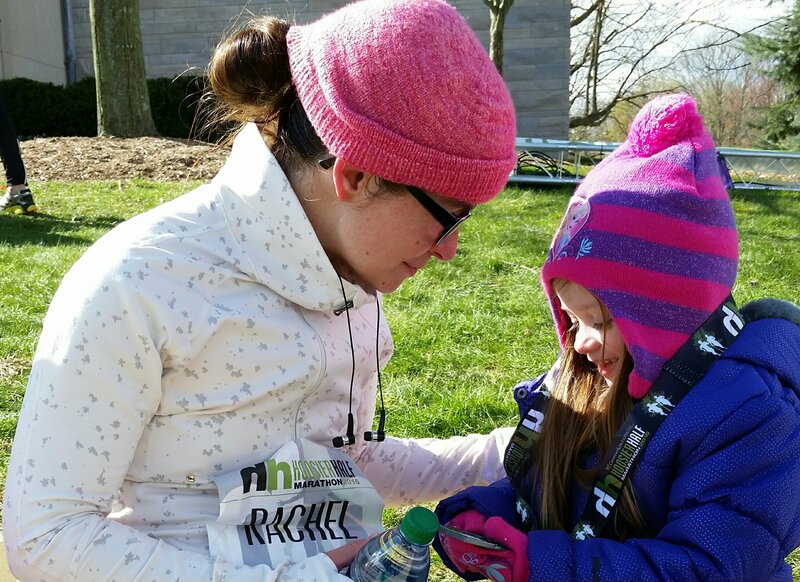 Bloomington’s Hoosier Half is a hilly course. It is 13.1 miles of hills. And not tiny hills, either. Now, honestly, the hills weren’t all bad. I actually rather enjoy running on hills, and prefer them to flat terrain. I like how rolling hills slingshot me along in my runs, and I even find myself gleefully chanting “challenge” on the uphills and “recover” on the downhills as I pop along my usual running routes. But I do wish I would have focused specifically on the hills more. I’ve had multiple friends make comments about how strong my thighs have become throughout my training, and I always credit my hilly runs. But the course turned out to be more challenging and hillier than I anticipated. So, next time, I’ll have to talk myself into tempo and hill workouts more often than I talk myself out of them! I will never have trained “enough.” Runners are typically self-motivated perfectionists, and overly critical. 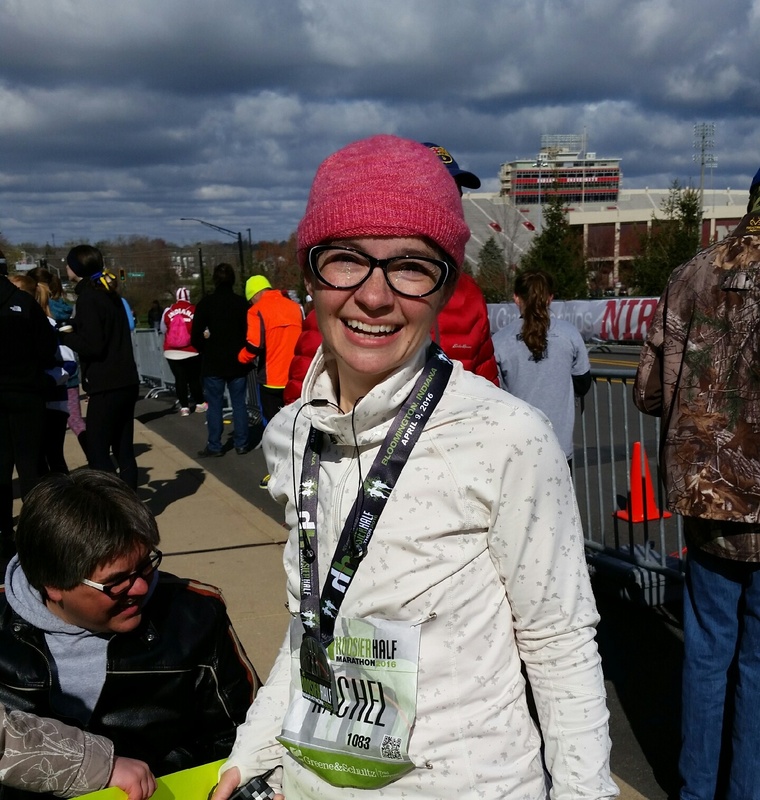 Though, as a first-time racer, I was technically only training for and working towards a distance goal (“Just finish, just finish, just finish”), I couldn’t help harboring secret pace goals as well (“I can certainly manage a sub-2:30 half. But maybe a sub-2:15? Oh! What if I could do a two-hour half?? That would be amazing!”). As I trained, my absolute fastest and best times had me fantasizing about a 2:11 half-marathon. 131 minutes. A solid ten-minute/mile pace. Middle of the pack. Respectable. The day of the race, I started out just behind the pacer holding the “2:15” sign. “You’re mine,” I thought to myself. “I’m staying on you.” I even entertained visions of pacing with her, then blasting past in the last mile. I kept up with her for the first five miles. Then, she slowly pulled away. I tried to push my legs to move faster. But eventually she turned a corner, and I didn’t see her for the rest of the race. I could feel myself slowing in the last three miles. I kept pushing, terrified that the “2:30” pacer was just behind me, ready to overtake me and ruin even my outside, “safety” goal. I finished in 2:18. I’m happy with that time. I really am. But I also can’t help thinking that if I had trained just a little bit harder, I could have run a sub-2:15 half. Or even a 2:11. If I had added just a few more cross training sessions. Or a few more hill workouts. Or not slept in on those particularly cold, dark winter mornings. . . But I also know that there will always be a faster time, a longer distance. I did it. And in a good time. That should be enough for now. Right? Besides, there’s always next time. I’m already thinking about next time. Do I want to wait a whole year to do it all again? Or should I try to train for one of the fall races? Maybe I should focus on a shorter distance to work on my pacing and speed? I definitely don’t have any desire to try a full marathon right now (with two small children, I barely had the time to fit in my long runs for the half!). But I’m sure I could do better next time. There’s another race coming up in November. That’s right near my birthday! Maybe . . . ? Never, ever, ever wear perfume while running a long race. Seriously, are you trying to kill us all?? Notice how everyone kept trying to pass you? It’s because we were trying to get out of the downwind! You stink. Stop it. Once you get out of the pack, you find your people. Dear Hispanic Lady in the Purple Jacket: You were awesome. 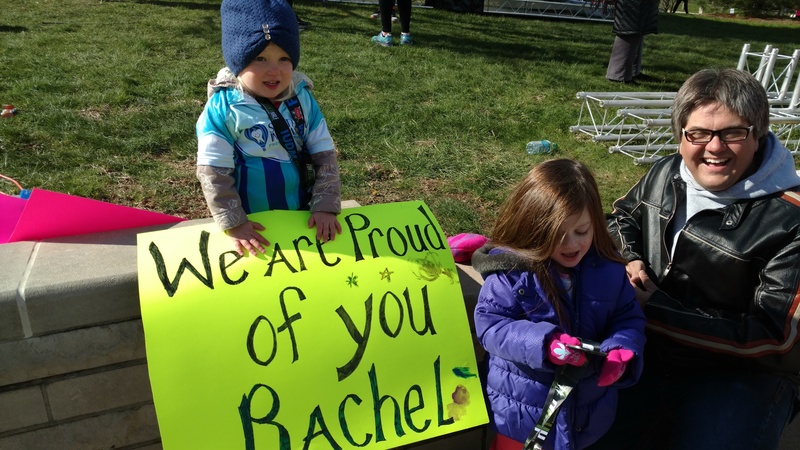 I lost you in mile 10 after Heartbreak Hill (you recovered much faster than I did), but you made that run so worthwhile. We were unofficial running buddies for the first ¾ of the race. We exchanged knowing eye-rolls whenever we had to deal with the “perfume twins” in front of us. We both thanked all of the police officers who controlled traffic so we could safely pass through Bloomington’s busy streets (and nodded every time we noticed that the perfume twins didn’t. Kids, right?). You were funny. And we gasped, panted, swore, and muttered small words of encouragement that were half to ourselves, half to each other. You got me through it. You really did. I’ll never forget you. Even if I only ever saw the right side of your face. Much love, Rachel. The feeling immediately after is similar to a hangover. It’s all such a blur. And I really have to poop. Also, why am I so sore in these unexpected places (my core felt like I had just done about 100 sit ups. For no apparent reason). Oh, god, my head. I really should drink water. Like, a lot of water. But I’m pretty certain that a beer would make me feel even better. I kind of have to puke. But I also kind of really want a fried egg. What did I just do? Did I just do that? Seriously, how did I even get home after that? Showers are magical. My husband is lucky that our hot water heater is broken, because if that shower had lasted any longer, I would have left him for it. Imodium, Poise Pads, Ibuprofen, Water Proof Band-Aids. But the greatest of these is Imodium. A while back, a friend of mine asked me if I was running this race “for” my girls. It’s a hard question to answer, and I stumbled over my response at the time. Because, as a mother, as a woman, as someone with ambitions and dreams and hopes, just about everything that I do is some combination of mine and theirs. I needed to be away from my girls while I trained for this race. I needed to rely on family, friends, and my community to help me while I left them, to be by myself, and work on something that was just for me. I left my girls with friends, and literally ran away from them. But my hope has always been that they don’t just see my back getting smaller as I run away. I hope that they see what I’m trying to run towards. Health. Fitness. Self-confidence. Courage. Strength. Motivation. Satisfaction. Sacrifice. Reward. My sister went on to become a professional dancer in Chicago. I was a ballet minor in college, and played softball (very badly!) in high school. My big brother plays ultimate frisbee. None of us are involved in what could be considered traditional sports, but we all have found our niches. After the race on Saturday, I called my mom. I told her about seeing Sophie at the finish line, and only looking at her as I crossed. She was giggling, she was so happy. It’s true, my daughters already tell me that they need space in order to do their “exercises.” They practice their ballet. They do jumping jacks, and run in place, and stretch their arms and legs out as far as they can. And I guess that’s why I did this. So I could see my girls, smiling and giggling, as they stretch themselves out as far, and wide, and big as they can. Because they saw mommy do it first. Pacing is clearly my Achilles heel. My husband took this as I approached the finish line. I’m waving a bending down towards my daughter. I started crying immediately after crossing the finish line. My friend and her daughter made me signs! Once again, my community is what kept me going. 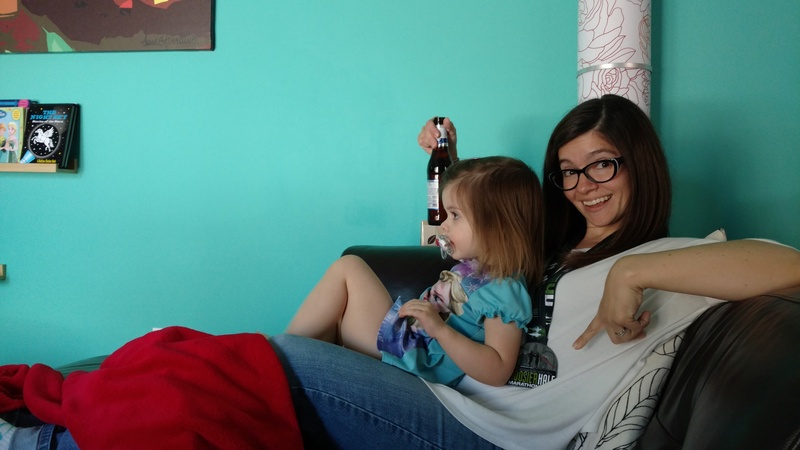 Afterwards: On the couch, drinking a beer, holding my youngest daughter, still wearing my medal. I wore it all day. 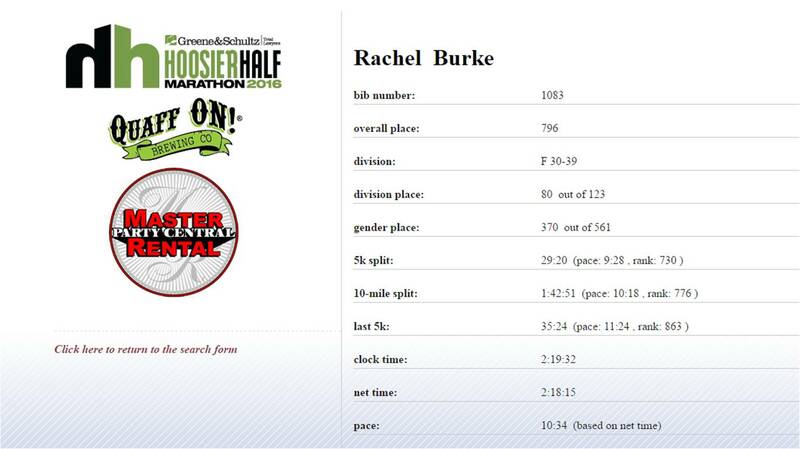 Oh, and I’m already planning on running the Indianapolis Monumental (Half) Marathon the first week of November. Anybody want to be training buddies?